Managed accounts are specialized user accounts that include parental controls. These types of accounts are a great choice when you want to give younger children free access to your Mac, but at the same time restrict the applications they can use or the websites they can visit. Parental controls provide a means of restricting and monitoring access to a computer. You can control the applications that can be used, the websites that can be accessed, as well as control which peripherals can be used such as allowing the iSight camera or DVD player to be used. You can also set time limits on using the computer, as well as limit iChat or Messages and email to receive messages only from accounts that you approve. If your children spend a lot of computer time playing games, you can also limit access to Game Center. Finder and Applications. Depending on the version of OS X you are using, you can choose the normal desktop and Finder, or a special Simple Finder that only allows access to the user’s home folder and any applications you select. If you choose the normal desktop and Finder, you can still restrict access to specific applications, although all of the items in the Applications folder will remain visible. You can also enable or disable the use of the Mac's built-in iSight camera and limit how Mail is used. Content. You can put profanity filters in place to limit access to specified words that are included in the Mac’s Dictionary application. You can also choose to filter websites, or block or allow access to specific websites and their content. Mail and Messages. Almost everyone needs (or at least wants) access to email or Messages. By enabling parental controls, you can decide who will be allowed to send messages to a managed account. You can even choose to be notified if the managed account user tries to contact someone who isn’t on the email and Messages list. Time Management. You can use a managed account to set limits on when the Mac can be used, and for how long it can be used. There are separate limits for weekdays, weekends, and school nights. Logs. 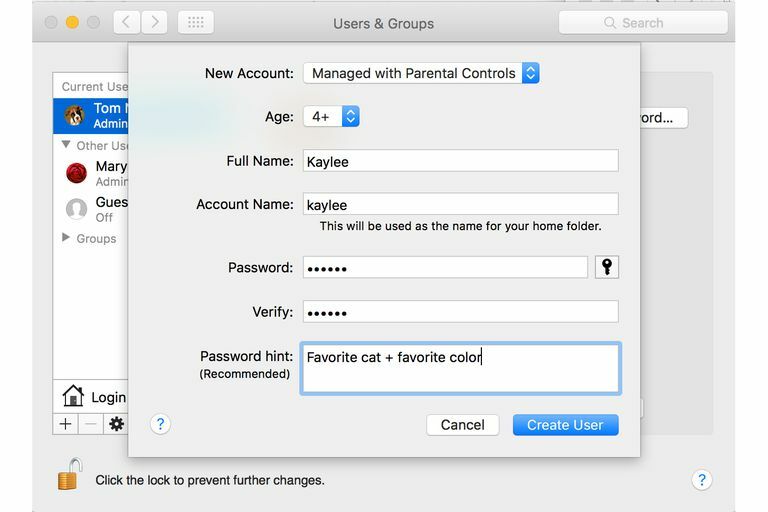 You can configure the parental controls to maintain logs of visited websites, blocked websites, application usage, and iChat usage. Before you begin, make sure you first log in with an administrator account. Launch System Preferences by clicking its icon in the Dock, or by selecting System Preferences from the Apple menu. Select the Accounts or Users & Groups icon to open the Accounts preferences pane. Select the lock icon. You will be asked to provide the password for the administrator account you are currently using. Enter your password, and select the OK button. Select the plus (+) button located below the list of user accounts. Select Managed with Parental Controls from the New Account dropdown menu. Use the dropdown menu and select an appropriate age range for the account user. Enter a name for this account in the Name or Full Name field. This is usually the individual’s full name, such as Tom Nelson. Enter a nickname or shorter version of the name in the Short Name or Account name field. In our case, we would enter tom. Short names shouldn’t include spaces or special characters, and by convention, use only lower case letters. Your Mac will suggest a short name; you can accept the suggestion or enter the short name of your choice. Enter a password for this account in the Password field. You can create your own password, or select the key icon next to the Password field and the Password Assistant will help you generate a password. Enter the password a second time in the Verify field. Enter a descriptive hint about the password in the Password Hint field. This should be something that will jog your memory if you forget your password. Do not enter the actual password. Click or tap the Create Account or Create User button. Proceed to the Users & Groups preference pane as outlined above. Select the Lock icon and provide your administrator account password when asked for. From the list of accounts, select the user account you wish to change to a managed account. Place a checkmark in the box labeled Enable parental controls.